Israel struck two alleged terrorist military posts after a rocket from Gaza was aimed at Israel but missed. The Israeli military says it struck two alleged terrorist military posts in the Gaza Strip today after two rockets were launched at Israel from Gaza, but fell short. The military says it blames Hamas — "a Palestinian Islamic political organization and militant group" — for all fire coming from the Gaza Strip. 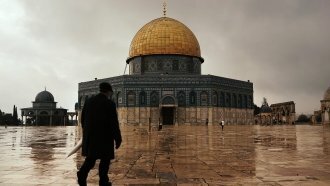 The violence comes the day after President Donald Trump said he recognized Jerusalem as the capital of Israel. Hamas' leader Ismail Haniyeh told Palestinians to rise against Israel, saying Trump's decision declares war against Palestine. Hundreds of Palestinians protested on Thursday by burning posters of Trump, Israel's prime minister and the Israel and U.S. flags.